Laura at Hey What's for Dinner Mom? posted this recipe last week and it was immediately put on the list. I chose cabbage as my week's BSI choice and I've made several yummy recipes including rustic cabbage soup, creamed cabbage, golabki, New England boiled dinner, cabbage nests with sausage, and roasted veggie cabbage nests. I have always liked cabbage, but since starting the food blog I've really come to appreciate it a lot more. And at .69¢ a pound (sometimes on sale as low as .19¢ a pound), it's also a steal! 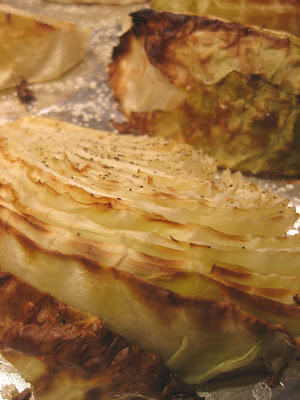 Preheat the oven to 375° and wash and cut the cabbage into 8 wedges, leaving the core intact. Coat with olive oil and season with salt and pepper. Put on a baking pan and roast for about 40 minutes. Once roasted, remove from the oven and let cool slightly while you are preparing the sauce. Lower the oven temperature to 350°. Melt the butter in a medium skillet and add the flour. Mix together until it's bubbly, then add the milk. Stir and let it thicken for a minute or two. 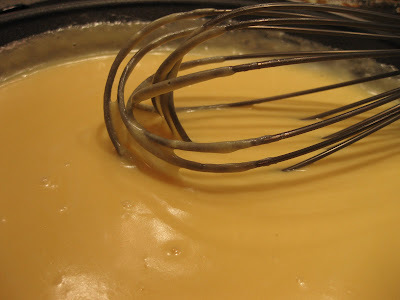 Then add the cheese, and stir until it's all melted. Cut the cabbage into smaller pieces, and spread into a greased baking dish. Pour the sauce over the cabbage and stir to mix everything. Pop back into the oven, uncovered for another 20 minutes until the sauce is bubbly and the top begins to brown a little bit. This one is definitely a keeper! I've never had cheese sauce with cabbage, only with broccoli or cauliflower. Great call, Laura!! I served the cabbage alongside my first ever flank steak (post forthcoming)! Johnny said it's one of the Top 5 tastiest dinners he's ever had, or that I've ever made! Who's watching Top Chef this season!? I love Jennifer, Kevin, and the brothers, although I favor Bryan more than Michael. Johnny said a few weeks ago it was going to be a tough season. I asked why? and he said because there's so many good chefs - it's a different caliber than past seasons. He warned it'll be a lot harder for us to say bye to some of them. I understood what he meant this past week when Ashley was let go. I really liked her and felt like it wasn't her time to go - it was just the bad luck of the situation. I cannot stand Michael Isabella, he's a whiney brat, and Robin seems to have skated by a few challenges. I would have preferred they go home before Ashley did. Who do you think will win? I'm gunning for Jennifer, but wouldn't complain if Kevin or Bryan won! I would totally eat that cabbage just plain roasted. It looks so good! No idea for Top Chef - I don't watch it. Well hot damn! I'm so glad you liked it. And Johnny too. My kids ask for it all the time and I have to try and make it only once a week. But like you said cabbage is so inexpensive and we can actually grow it up here so it is good all the way around. Thanks for the shout out Christina. Oh and I don't watch tv only neflix. i agree with maggie! that roasted cabbage looks awesome! Wow. Slather cheese on anything and I'll eat it. Even if it's my own liver. I have never had roasted cabbage before - looks amazing! Do you remove the core after the first time in the oven? Your flank steak looks perfect my dear! I think Robin should have gone home a LONG time ago - I think its going to be Jennifer or one of the brothers. The brothers are just a bit too competititve against each other! I was planning on removing any core that was still tough, but it was all really tender, so I left it. I had one bite in my serving that was a little tough, and J had none. So I think it can just stay, since it bakes for about an hour! This does look really good. Veggies covered in cheese are always a winner. I've never eaten cabbage until recently either, and I'm a little surprised that 1) I don't hate it and 2) it's a pretty versatile food! I don't use cabbage nearly enough and this sounds like a tasty way to enjoy it!